The Canberra Cycling Club Juniors range from Under 9 years to Under 19 years. As a club we are very excited to be able to provide such a great junior program for our members. TIME: 9 am to 2:30 pm – with 2 sessions running throughout the day. 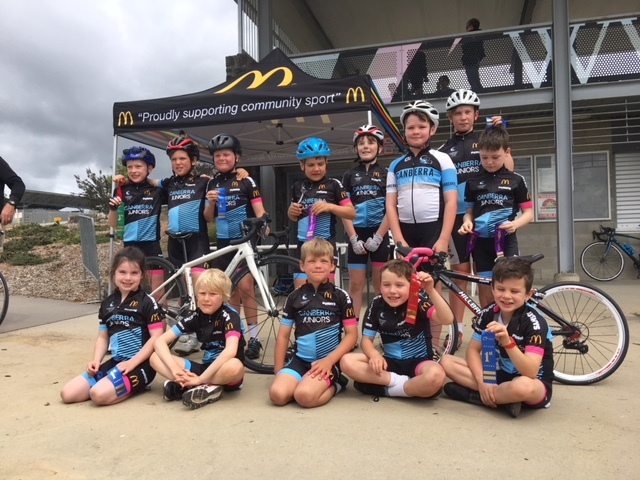 This is a great event for children aged between 6 and 16 to come out and learn some cycling skills and racing on the Criterium Track for first timers. Come out and give bike racing a go! Any road-worthy bike is suitable, but we do require an Australian Standards Helmet. This is all conducted in a safe, traffic free environment. Coffee and a Sausage Sizzle will be available on the day thanks to Here’s The Coffee and the Junior Cycling Development Fund.